﻿ HuntingNut » Forums » Hunting » Varmint Hunting » R-25 for varmints ? Posted: Wed May 06, 2009 7:24 pm Post subject: R-25 for varmints ? Hi fellas, I am thinking on getting a Remington R-25 auto rifle in 308 soon and was wondering if any body had one of these rifles ,and if they would be a good rifle for not only big game hunting, but what ammo or reloads could be used for varmint hunting also. Thanks fellas. Posted: Wed May 06, 2009 7:29 pm Post subject: Re: R-25 for varmints ? Posted: Wed May 06, 2009 8:05 pm Post subject: Re: R-25 for varmints ? I don't have an R-25 but the 308 Winchester cartridge is plenty good for big game hunting and for varmints. Any ammo can be used for varmint hunting; any that will put a hole in the animal that is. The main criteria for varmint ammo is accuracy because the range may be long and the target small. If you don't care about the hide, anything goes. If you do care about the hide, choose a solid, an FMJ or one of the heavier expanding bullets. Also consider the kind of accuracy you want when buying a gun. If the R-25 is like other semiautos I've shot, accuracy should be good enough for deer out to 300 yards with iron sights. With a scope and tailored reloads, a good semiauto should be capable of 1.5 inch 3 shot groups at 100 yards. If you wish to have better accuracy than that, go with a bolt action rifle or a break action Thompson/Center rifle. Posted: Wed May 06, 2009 8:28 pm Post subject: Re: R-25 for varmints ? There are several 0.308" dia varmint bullets available for handloading; Hornady V-Max, Speer TNT, etc. I don't know about any factory loads. Posted: Thu May 07, 2009 7:57 am Post subject: Re: R-25 for varmints ? 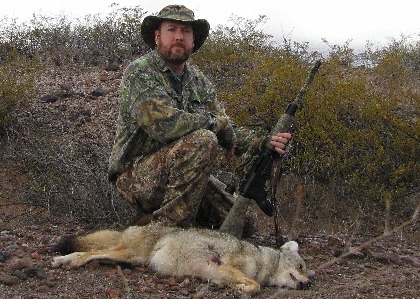 I have loaded the 110gr V-max and the 125 Speer TNT in a 30-06 with great success on coyotes. You will have to tune the load to the gas gun pressure range but they should still be good for the predators you are after. Posted: Sun May 10, 2009 1:59 pm Post subject: Re: R-25 for varmints ? Yote smoked with an AR-15 at 250 yards. Posted: Sun May 10, 2009 4:10 pm Post subject: Re: R-25 for varmints ? Good luck finding an R25! Posted: Mon May 11, 2009 5:22 am Post subject: Re: R-25 for varmints ? Posted: Mon May 11, 2009 2:48 pm Post subject: Re: R-25 for varmints ? Bonita, The reason for the x25 is that Stoner the originator of .308 a.r. 's called them the s.r.25 which these are kinda like. A purist would disagree however and quote the multiple differences. Posted: Mon Jun 22, 2009 8:22 pm Post subject: Re: R-25 for varmints ? 110gn vmax drops em dead fast. A very full case of varget shoots good in several AR10s within a club I belong to. Almost everyone gets good accuaracy at close to max load so be carefull and work up carefully. If you don't reload, Hornany makes a TAP load that will get the job done too. I've killed quite a few with that load. sorry about jumping in a month late. Posted: Wed Jan 13, 2010 11:39 pm Post subject: Re: R-25 for varmints ? I just purchased a r25 in .243 and am in the process of developing loads. My friend has the same rifle and his loves 42 grains of imr 4064 with the 58 v-max naked (non moly), can cover 3 shots at 150 yards with a nickel, 3557 fps chrono at 15 feet. Coupled with the nikon coyote bdc scope his is deadly. We have called in numerous yotes and have extinguished 26 of them since Nov.16. Follow up shots if needed are very easy and no kick at all so target acquisition is great. I'm currently trying the new imr 8208 xbr and started with 38 grains with the 58 v-max and it is traveling 3525 fps and is very quiet and absolutely no kick. Alot less pressure and noise than the imr 4064 and only around 30 fps less. This powder 8208 xbr seems very promising and I may bump it up a little more to around 3600, but I absolutely love the noise level and kick with only 38 grains. Barrel length is only 20 inches and I really don't need to load em up hot to try and squeeze more speed. Very accurate and puts the coyotes down quick the way it is. You can always choose a different bullet and go deer hunting with it. I am very picky when it comes to accuracy, I stay at the loading bench until I can get the bullets touching at 100 yards. I am very satisfied, this rifle has passed the test for me. Posted: Fri Mar 12, 2010 2:32 pm Post subject: Re: R-25 for varmints ? Why? there are 3 on the shelf at the local GS here! Posted: Wed Apr 28, 2010 7:38 pm Post subject: Re: R-25 for varmints ? This is an incredibly long running thread. When the "Good luck finding an R25" quote was made it was about a year agoe when they were tough to find. Things have lighened up since then. Posted: Thu Apr 29, 2010 5:04 am Post subject: Re: R-25 for varmints ? My shooting buddy has both and R-15 and R-25. R-25 was very accurate and outperformed my bolt .308. It is much heavier than the R-15 so not as pleasant to carry in the field. The most glaring difference between the two for me was their triggers. The R-15 has a light, crisp trigger - SWEET. The R-25 had the most creepy, gritty trigger I've every shot on an AR - and it still out-shot my bolt gun with a jewel trigger.